Lying at the base of the San Gabriel Mountains, the 200 square mile valley that was once primarily agricultural, is today highly developed into a diverse urban area. Steeped in history, the drive through the valley provides an abundance of museums, historical landmarks, roadside peeks, and entertainment for a new generation of Route 66 travelers. To the north of the valley, in the San Gabriel Mountains, adventurous travelers can find find hiking trails, camping, water sports, and old mining towns among the forests and canyons. Straddling the San Gabriel and Pomona valleys, San Dimas was first called Mud Springs when people began to settle there in the early 1800’s. Part of the Rancho San Jose, the last Spanish land grant, the area was swampy, hence its nickname. The town was officially formed by the San Jose Ranch Company when the railroad came through in 1887 and the community’s name was changed to San Dimas to reflect the San Dimas Canyon to the north. E.M. Marshall opened the first business – a hardware store at the corner of Bonita and Depot Streets. In each of the town sites along the railroad, a hotel was built for the expected rush of settlers. However, the land boom lasted only two short years before collapsing in 1889, without the San Dimas Hotel ever having had a single visitor. This historic building is the only one of the many hotels along the line from San Bernardino to Los Angeles that has survived into modern times. When the hotel failed, it was purchased by the J.W. Walker family whose family occupied the home for six generations, from 1889 to 1978. 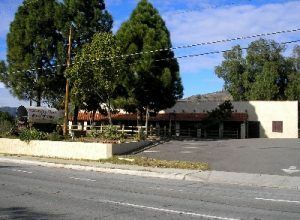 After a stint as a restaurant, the old hotel was listed on the National Register of Historic places, and is now owned by the City of San Dimas. Also known as the Walker House, Carruthers Home and the San Dimas Mansion, the historic landmark is located just north of the intersection of Bonita Avenue and San Dimas Avenue. San Dimas developed as an agricultural center like the many other small towns along the railroad. After trying out several different crops, area farmers recognized that oranges, lemons, and avocados did the best. At one time, the city boasted four citrus packing houses and a marmalade factory. It was here that the Sunkist name, originally spelled “Sunkissed,” originated. The San Dimas Feed Company, established in 1897, continues to operate today and is the oldest business in the city. 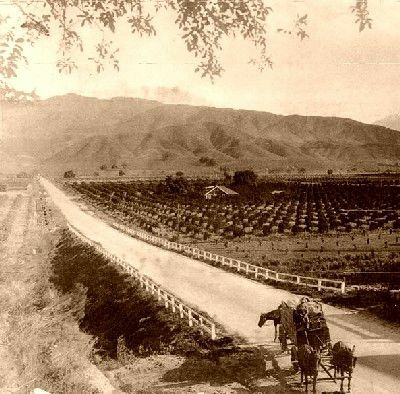 Unfortunately, by the 1950’s the citrus trees were suffering from a disease and the quiet agricultural life came to an end as groves were cleared for housing tracts. San Dimas today prides itself in its heritage, especially that of the Old West. In the 1970’s a “Western Village” concept was developed for the downtown core, complete with wooden sidewalks and false wood storefronts for a frontier look. In the fall each year, San Dimas hosts a rodeo at Horsethief Canyon Park along with Western days, and a myriad of equestrian paths exist throughout the city. Other historical peeks can be seen at the San Dimas Train Depot, which now serves as a museum, located on Bonita Avenue at the west end of Old Town; the old hotel, called the Walker House today, is just north of the intersection of Bonita and San Dimas Avenues; and the Chamber of Commerce located in the historic Martin House at 246 East Bonita Avenue. While in San Dimas, a “must stop” if you’re hungry is the Pinnacle Peak Steakhouse at 269 W. Foothill Boulevard. Here, you will find great mesquite-broiled steaks in an Old West saloon type atmosphere. Boasting a wagon train in its parking lot, Pinnacle Peak’s has been serving great food to travelers of the Mother Road for decades. But, know going in, that this is no “fancy” place. In fact, if you where a tie in here, you’ll soon find it dangling from the ceiling with hundreds of other ties “donated” by the many other patrons who made the same mistake. Within just a few blinks you will know have entered Glendora, very easily the proudest Route 66 town along this stretch of the vintage highway. 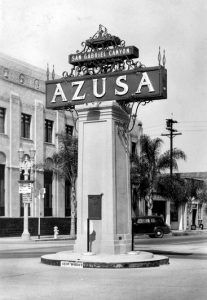 Dotted with signs and businesses named for the famous road, Glendora was the first city in California to change the name of its main street, which was Alosta Avenue, back to Route 66. The new settlers began to plant castor beans, wheat, potatoes, and the ever present citrus groves. By the turn of the century, Glendora had become the center of the citrus industry, shipping product all over the world. Over the years, the city continued to grow and orchards were replaced with new homes and businesses. In addition to Glendora’s new signs and businesses along the Mother Road, the city continues to sport several vintage views of an earlier time along the path. At 1223 E. Route 66 you will find the Golden Spur Restaurant that has a history dating back more than eighty years. 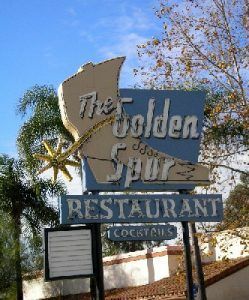 Though its “new” stucco exterior belies its long history, the Golden Spur began as a ride-up hamburger stand for the equestrian crowd. Today, the old restaurant offers a full menu of steak and seafood, but its vintage neon sign, complete with a cowboy boot, remains as a reminder of its colorful past. On the southwest corner of the intersection of Route 66 and Loraine hides a 1940’s gas station. Unless you stop and look for this wonderful relic, camouflaged by a tall evergreen hedge and a chain link fence, you’ll never see it. A bit further down the road at 437 E Route 66, look for the old Alta-Dena Dairy painted in a myriad of vibrant colors and at 619 W. Route 66 you will see the Palm Tropics, one of the best maintained old motels along the route. Glendora also sports a quaint downtown district where several of its buildings haven’t changed for more than a century. In addition, Glendora offers several annual festivities that celebrate its rich heritage such as the Flashback to the ’50s, the Great Glendora Festival and the Route 66 Mile Run. Nestled at the foot of the San Gabriel Mountains, Shoshonean Indians, known locally as the Gabrielino, were roaming the area when homesteaders began to settle the land. Known to the Indians as Asuksagna, meaning either “a place of water” or “skunk” depending upon who you talk to, it was from this Indian word that the city would take its name.